It’s time for more stories about our wine tasting adventures. There are few things that I should clarify first. Namely, we have not been to all of the wineries yet, although we did give it our best shot. There is probably another 30 or so waiting for our arrival. You can only do so much. That being said, I can’t tell you what the best winery is to visit, these are my thoughts and opinions for right now only and I can’t really pick a favorite until I’ve tried them all. Selfless person that I am, I promise to do this for you and let you know how it goes. Second to that, we did not visit all of them in one day, not even in two days. We had a designated driver, but among our group we were all pretty much responsible-in case you were wondering. Third, by no stretch of the imagination am I any kind of expert on wine. There are pretty much only two questions that I ask myself when I’m drinking wine. The first is “Do I like it?” and the second is “If I like it, how much of the rest of the bottle do have to share?” As I go along I am always learning and picking up new information, but really I just want to have fun and enjoy the company I’m with. I spend zero time worrying about legs, bouquet, vintages, and best growing years. I can tell you though that muscato pairs really well with your Chinese food after work on Friday night. Before this summer I had never been to a tasting and didn’t know how they worked. The lowdown is pretty much this: tastings are one ounce and some places have a maximum number of tastes you can have at one time. Some wineries have free tastings, some were a dollar each, some two dollars , and some were three for five dollars. Some wineries let you share the tastings with other people in your party, some not. Lots of flexibilty, and if you don’t mind sharing it’s a great way to try several different wines from one winery between you. The recommended guideline is that you start with the lightest white wine and progress to the heaviest/boldest (whatever the wine appropriate word is here) red. So choose wisely. As I left of last time (you can read about it here), our very first visit was to a nice smaller place called Lighthall Vineyards. It was friendly and casual and informative, and a great start to our adventure. When we had researched the area and where we wanted to try first, we had grouped our route by location. Hillier township seems to have the lion’s share of wineries, so the next day we headed in that direction. We stopped in Wellington along the way to visit a glassblowers shop as well as a local pottery. I am, by nature, too OCD to be creative and crafty, but I do appreciate people who are artistic and can actually make stuff that isn’t embarrassing to have on display in your home. After that we made the fortuitous first stop at a lovely place called Karlos Estates, and you should get in your car right now and go. Because it’s beautiful and fun, and certified vegan if that’s a thing for you. Like many of the wineries, they’ve refurbished an old decommissioned barn to set up shop. I grew up on a farm and we had a barn and a smaller shed built exactly in the same style as most of the barns we saw, but they smelled a whole lot better. It was clean and open, beautiful lighting, and the tasting room was comfortable and overlooked the back fields. You could happily sit for a long time, visiting with your friends and forgetting whatever cares you may have had coming in. I don’t know how people can put a chair here and a light there and a table over this way and make it homey, but that’s what they did. Karlos Estates was polished and set up for higher volume. We chose a table and the server brought a menu with several choices and explained their overall set up and procedure. The best part was that all of their wine tastings came with a food pairing. How fun is that? Each wine had a different designated food item, a cheese, nuts, wasabi peas, and even chocolate. It was ridiculous how much of a difference there was in the taste of the wine before and after sampling the food. 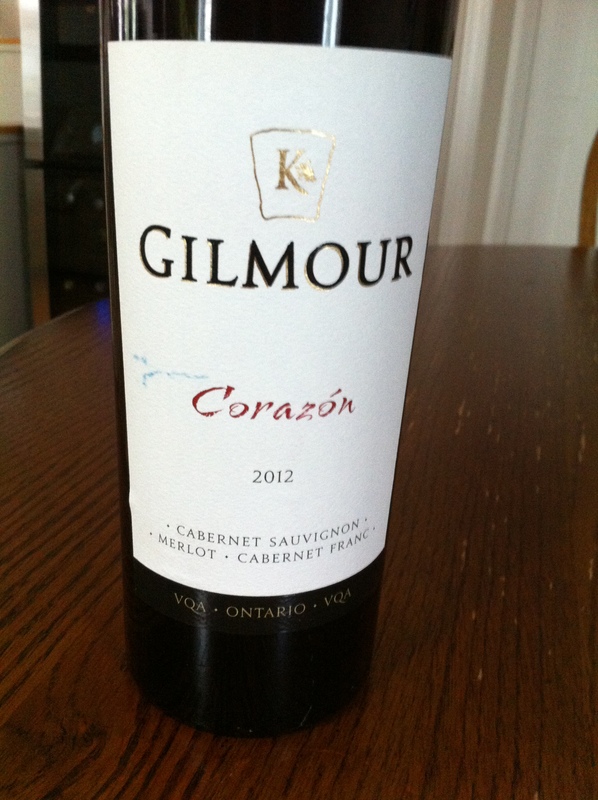 The best discovery that visit was something that I feel like is a little bit elusive in Prince Edward County wine, a really nice red wine called Gilmour Corazon. This is very good news for those of you living in Ontario because when we went back a second time to buy more of the Corazon we were told that it was not available as the LCBO has purchased the remainder to release to market in November 2015. The secret but not official consensus is that it is easier to make better tasting whites than reds in the County due to the growing season and the grapes that are best suited. This unofficially held true as at the end of the trip we had purchased white to red in about a 2:1 ratio. We did have some good reds, Sandbanks and Black Prince also provided us with some reds that we easily agreed on and liked. All in all over two trips, we purchased the Gilmour Corazon, the Patio Reserve Rosé and the Van Alstine Red. The Van Alstine Red is in the port style and it’s pairing was chocolate. Like I was going to walk away without taking that baby home. Coming to a store near you in November. 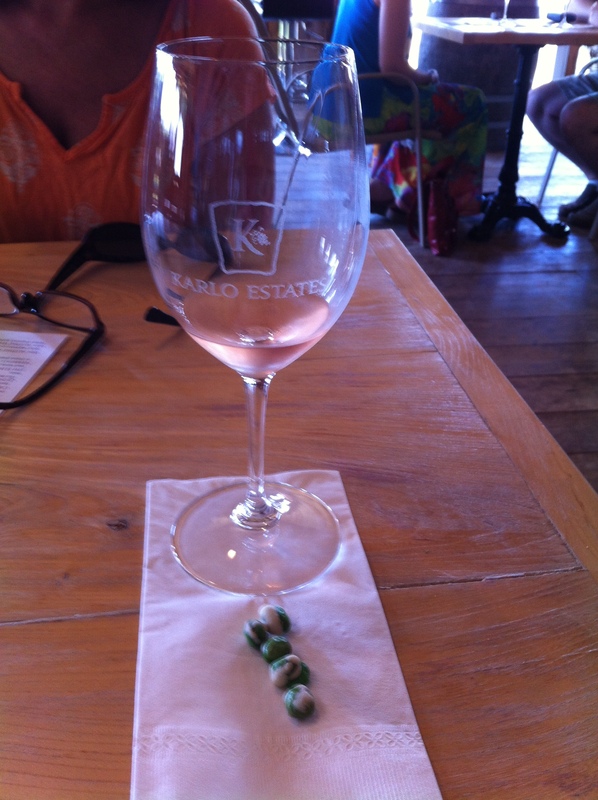 The Patio Rosé with some wasabi peas. Hubbs Creek Vineyard was literally across the street, could they make it any easier? Again, We added a Gamay Rosé to our collection. Again, lovely friendly owner only to happy to tell you about their wines and the care put into making them. It is an incredible amount of work to make wine I have learned and to be skilled at both the production of the wine and then being able to carry the more social sales side of the thing has got to be a rare combination. We saw this frequently, but I have a great deal of respect for these people, especially the smaller operations where you have to do it all until your business really takes off. We visited a number of wineries after that, but I’m not going to go into sequential order. I wasn’t planning on blogging it at the time and don’t have detailed notes or photos for them all. I will however tell you about some of the highlights. Not everyone is meant for customer service. It’s a skill that has to be developed like any other, but some people just have a natural ability to work it. 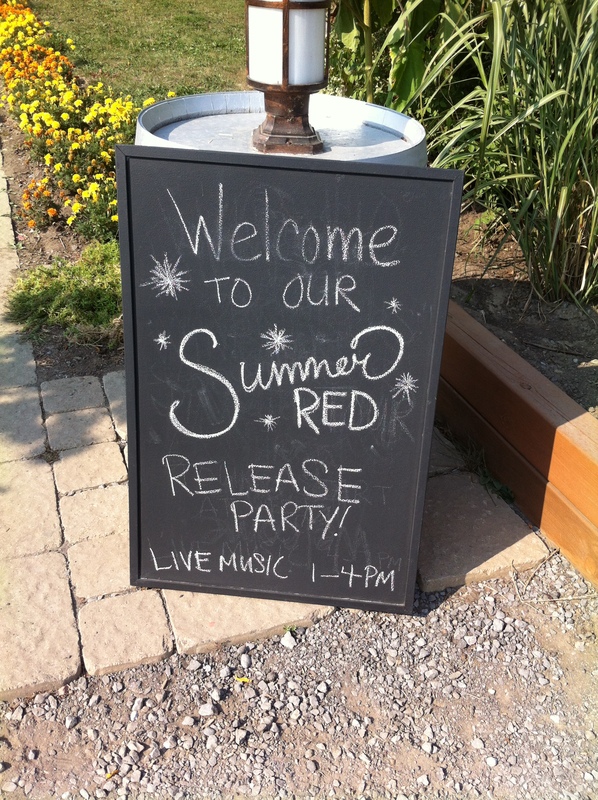 We went to the Sandbanks winery twice over the summer and both times lucked out to meet a funny server named Katie. Here opening line was, “I’m sorry if I seem tired, I was out last night and there is a riesling that I look this way”. I bet that she says that joke a million times a day, whatever, it’s a good icebreaker. Katie made us laugh and knew her wine and was pretty intuitive about what we should be trying from the very large menu. Sandbanks is big, bus tour big with multiple tasting bars inside and outside. Lots of bright chairs and a wonky sculpture of a moose, live music patio umbrellas. It’s like a garden party all of the time. Their wines were also the most affordable among all of the places we visited really. Some of them were just fun drinking wines not meant for much more than an easy gathering with your friends. Summer White and Summer Red were both contenders for being easy and fun. Others were more serious and this is where we found another of those pretty good reds called Baco Noir. We met another excellent server at the Black Prince Winery. Matt was also hilarious and knowledgeable and leveraged his somewhat recent science degree to tell us why wines aged in Canadian oak will have more vanilla present in them compared to wines aged in American or European oak. It’s all about lignins and cool climate. Matt also is planning to take his degree and experience in the local wine and distillation industry (yes there is a distillery in the County as well-I’m getting to that) and start his own endeavor providing quality control testing via a local lab that he hopes to set up. When I was in my early to mid twenties I didn’t even know what I wanted for breakfast. I expect that I might be asking Matt for a job in about five years because he’s certainly got plans. Black Prince Winery is in the town of Picton itself and what’s really unique about them is that they sell…fruit vinegar. If you read any of my other blogs you might know that I’m in the process of making fermented peach vinegar, so I was super curious to see and taste some legit product. We started with the wines, my friend was enamoured with Mary Jane’s Hemp wine, and we were happy to add another red to our collection to help us survive the winter, Cabernet Franc Terroir. After that we had a sample of the vinegars, they had a peach that day that was good but the raspberry and concord grape vinegar blew my mind. It was amazing and unexpected and sooo good. Up until then I had read and heard about people making their own vinegars and drinking them, and I thought that was a terrible idea. Really terrible. But this is the vinegar that changed my mind, easily I can see myself pouring a bit in a glass and topping it up with club soda and going on my merry way. For real, it was that good. 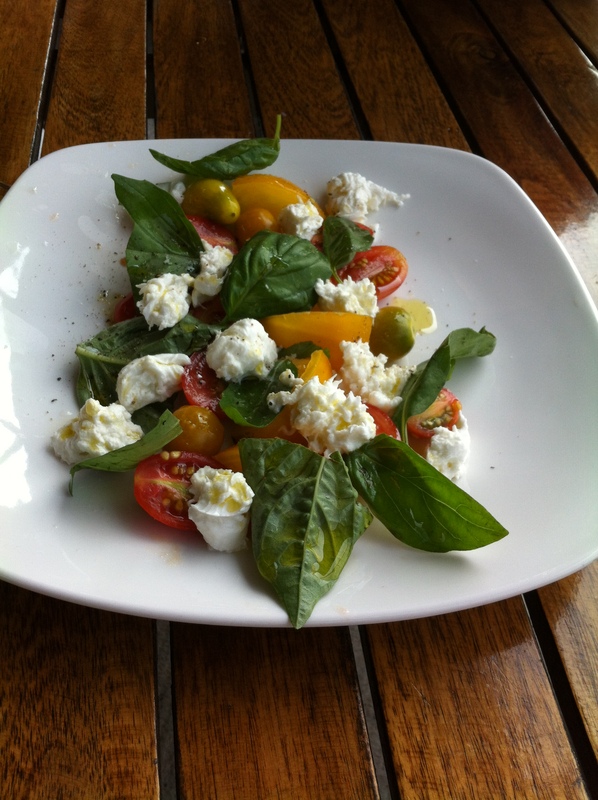 It’s also going to rock in a salad with goat cheese and I have to do some other research, but seriously good stuff. Do you know who else I liked? Tim from Broken Stone Winery. Do you know why? We showed up right before closing one day, we wanted to try one more winery on the way home and this one happened to be right there. It was a hot summer day, he’d probably been nice and polite and charming to people all day, telling the same stories, answering the same questions. Nobody wants people coming in five minutes before closing and standing between you and home. It’s actually not really a very considerate thing to do, but we didn’t realize we were doing it and Tim was gracious and kind and let us try his Vidal and his Chardonnay, both were nice and I recommend that if you are ever in the area to take a few moments and stop in. The second thing I really liked about Broken Stone Winery was that Tim and his family are still working at getting established and are not yet able to settle full time in the area. I think that almost all of us have a dream that would involve big brave steps and fresh starts, and I can’t help but celebrate when I find someone doing just that. My last winery today is going to have to be Norman Hardie Winery and Vineyard. I think I might almost be to old and too uncool to go there because the place was full of millenials and hipsters and was constantly buzzing with the sound of people having fun. 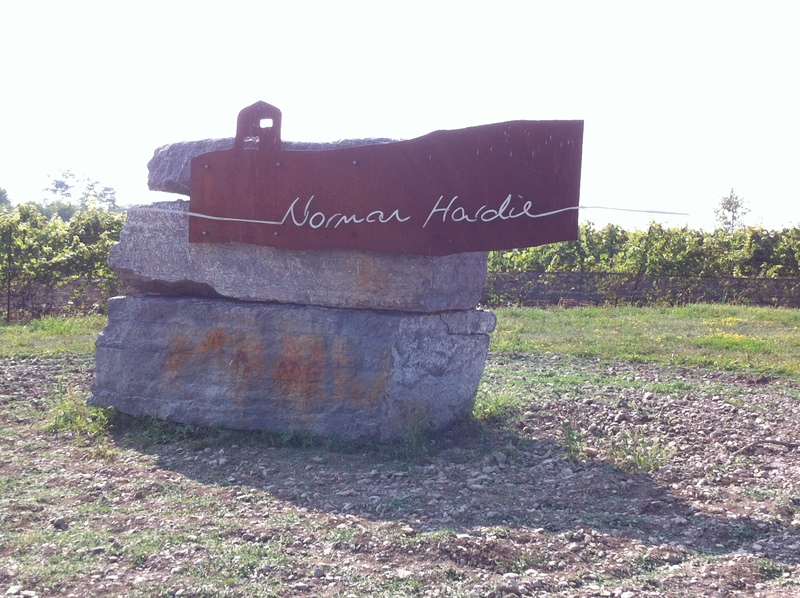 Norman Hardie is one of the bigger names in town and the winery is seriously set up. The hands down highlight was the stone pizza oven and outdoor patio. Oh my. 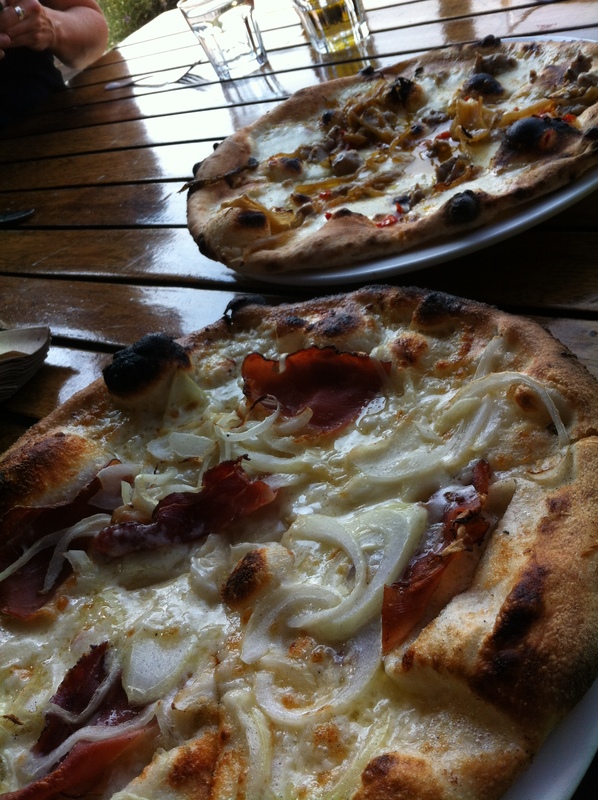 I’m still dreaming about the pizza. The place was packed and we had to wait about thirty minutes for a table. We made excellent use of our time by going upstairs and having a tasting first. Good wines and we brought home a riesling. 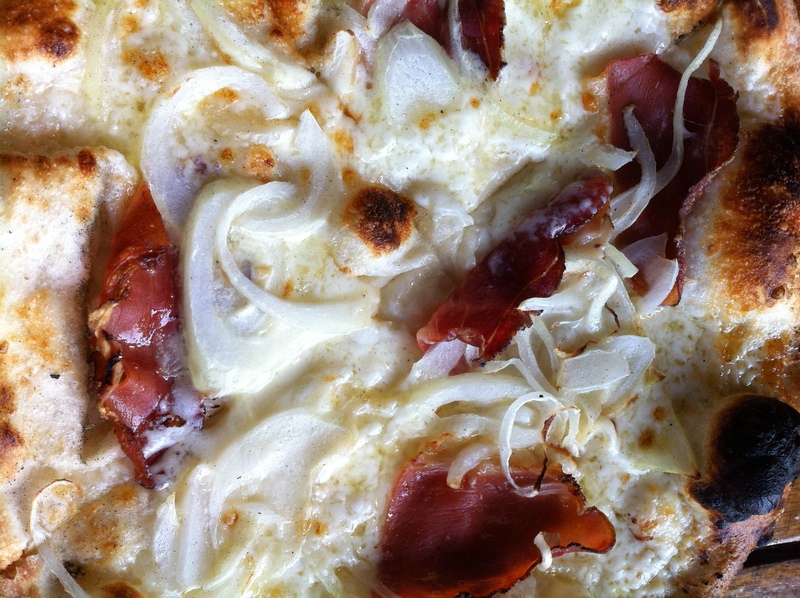 I’m not going to tell you about lunch, I’m just going to show you pictures. There was one other thing that really impressed me about this winery. We did not get a chance to meet the owner, he was there though, making sure everything was running smoothly. You can tell a lot about someone by how they carry themselves and how they treat the people around them. It was a busy day, it was stinking hot, and Mr Norman Hardie, owner and winemaker was busing tables alongside the rest of the team helping everything run smoothly. I don’t know if he does that every day, and I don’t know how he treats his staff when no one is around, but I do know that humility, service, and teamwork impress me way more than proving to the world that you are “in charge around here”. So that sums up my highlights. I think there is still one more post to be written about some other gems, as well as the distillery and the cheese factory. Please check out some of these lovely places, all of their links are below.